The problem: Even if you're careful about throwing your water bottles, straws, and sandwich baggies in trash cans, it's still very easy for that stuff to end up in water stream, according to David Godfrey, executive director of Sea Turtle Conservancy (STC). Once in the water, "bags float and looks like a jellyfish, which a number of turtles eat," explains Godfrey. "Turtles wash up sick or emaciated or dead and when we examine them we find plastic blocking up the gut track." Sadly, this also happens to the babies. "There are these areas in the oceans called convergence zones, where currents come together, and you get long lines of seaweed, where hatchlings live. They float in that seaweed and find food and protection from predators," says Godfrey. But that seaweed also collects debris, like bits of plastic. The baby turtles can eat or get caught up in it, killing them. What to do: Take your water and drinks to the beach in reusable stainless steel bottles. And choose biodegradable or reusable containers for food. The problem: "Sunscreen and sunblock give off a pretty toxic chemical when you wear them in the water," explains Godfrey. "The film runs off your body and settles into the environment, affecting its chemical makeup. When you have hundreds of people a day swimming and snorkeling in the water, these toxins accumulate - particularly in areas where there are reefs - and it's bad for plant life and for fish and for the turtles." What to do: Cover up with clothing and use turtle-friendly sunblock. "There are a number of products now with ingredients that are benign to the marine environment," says Godfrey. Try brands like Reef Safe and Do Naturals that are biodegradable. The problem: Turtles often migrate through popular fishing areas, and sadly, more than 250,000 are accidentally captured, injured, or killed by US fishermen each year, according to the STC. The turtles are attracted to the fishing bait and become caught on hooks and in nets. 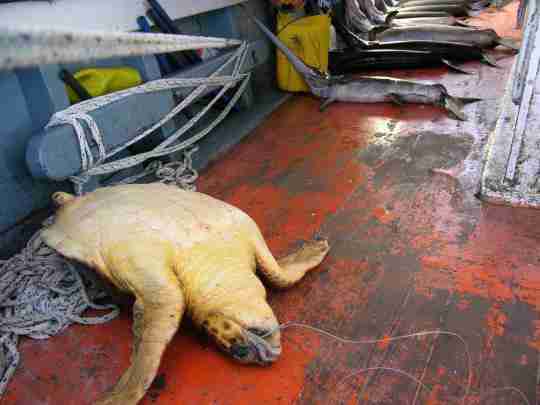 In fact, just this month, a sea turtle STC had been tracking since May was found dead on the shores of Colombia. Based on tracking data and location, experts believe she got caught in a fishing net and drowned. 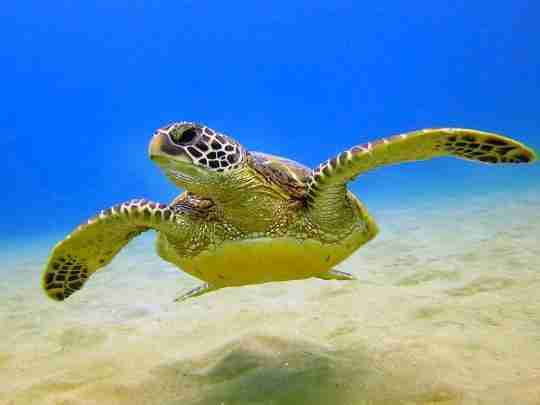 (Turtles can hold their breath for an extended period of time but must eventually surface to breathe air.) 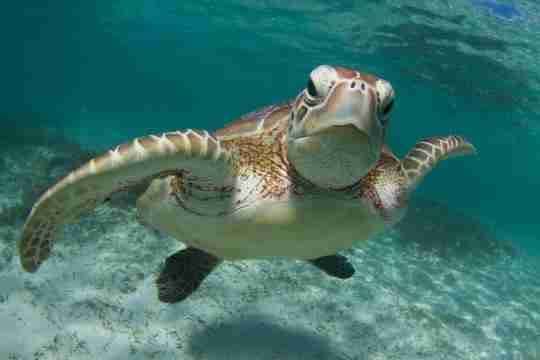 It's one of the biggest threats against the sea turtle population, according to the World Wildlife Federation. What to do: "The general rule of thumb is always get wild-caught seafood and shrimp from places where the fishermen are using turtle-friendly fishing hooks and turtle excluder devices on nets. They do this in the southeast US for the most part," says Godfrey. (Louisiana is the exception, though that may be changing soon.) You can search to find safely fished seafood at SeafoodWatch.org. And if you're not sure, ask! The problem: Some hotels and resorts in places like Mexico, the Caribbean, and Central America actually exploit sea turtles. 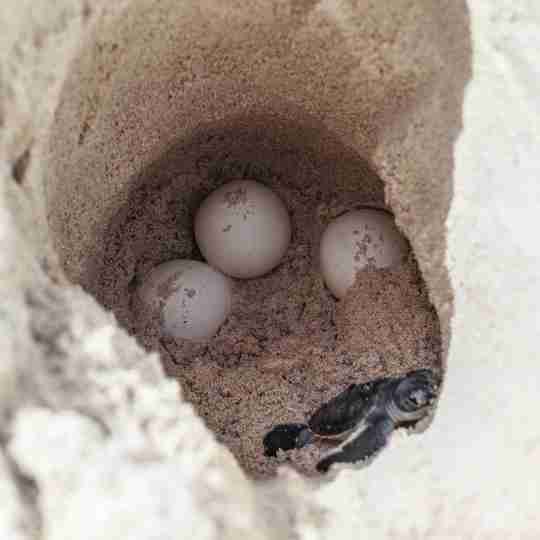 There are resorts that have staff dig up the turtles' nests and bring the eggs back to the resorts' private hatcheries. Then they sell the opportunity to release the hatchlings into the water. It sounds adorable, but it's deadly for several reasons. "Hatchlings held in captivity lose the very small store of energy they are born with to swim out into the ocean," says Godfrey. "They'll burn that energy just sitting in a bucket, waiting to be released, so they have no energy left to swim." Plus, these private releases almost always happen during the day, rather than at night or in the wee hours of the morning, as would happen in nature. "Baby turtles are sitting ducks during the day," says Godfrey. "That's when they're most visible to fish and birds. And these resorts let guest release one or two at a time, so they no longer have the protection of the group. "Sea turtles evolved to hit the water in group of 80 to 100 at night, so as many as possible can survive predators," explains Godfrey. What to do: Many of these resorts claim to be protecting turtles, but they are doing great harm. Avoid any place that advertises the opportunity to release hatchlings or otherwise handle the turtles. 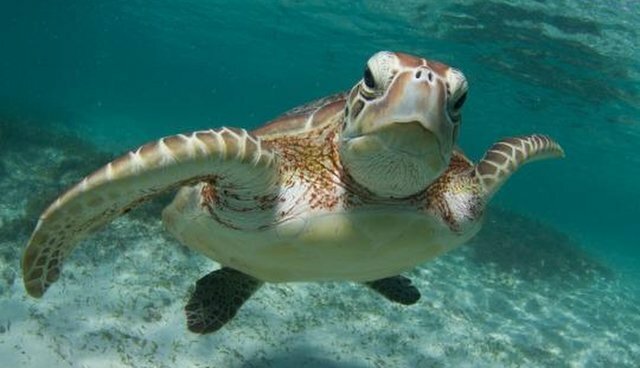 Ask question about a resort's turtle programs before giving them your business. The problem: One of the biggest things that disturbs sea turtle nesting is light pollution, according to Godfrey. Whether it's outdoor lights from beachfront rentals or resorts or nighttime beach goers using flashlights, regular old white and yellow lights are incredibly disturbing to sea turtles. 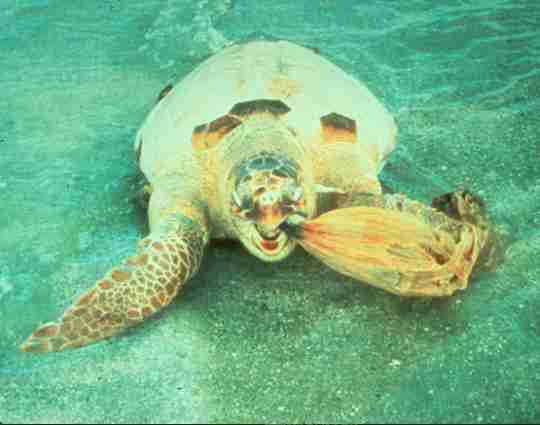 It can cause nesting turtles to flee the beach and return to the ocean without dropping their eggs. 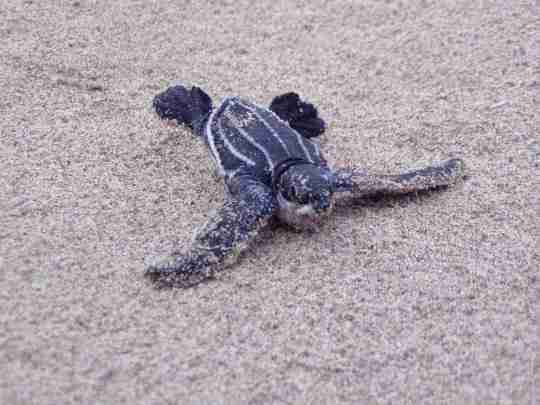 And what's worse, it is actually deadly to hatchlings: They are attracted to the light, and instead of heading toward the ocean, they follow the lights and end up in backyards, pools, sand dunes, even in parking lots and on roads. Not only does this deplete the small store of energy they have to get to the ocean, but when the sun comes up they're easy pray for birds or they can literally just cook in the sun. In addition, turtles can easily get caught up in beach chairs left outdoors and be injured or even die. What to do: If you have a beach rental on a nesting beach, turn off all exterior lights that face the shore. You can also inquire whether a beach house or resort uses turtle friendly lights (long-wavelength - 580 nanometers or longer - LED lights which glow amber or red). The lights are available at many retail outlets and online. In some areas, there is even grant money available to help pay for turtle friendly lighting. (The money comes from restitution made by British Petroleum after the 2010 Deepwater Horizon oil spill that killed or injured an estimated 100,000 sea turtles.) As or the furniture, fold everything up and put it away overnight during nesting season. Let Yahoo Travel inspire you every day. Hang out with us on Facebook, Twitter, Instagram, and Pinterest. Watch Yahoo Travel's original series "A Broad Abroad."